It is here! Babywise Success Stories week. I love hearing each year from you readers as you share the success you have found with using Babywise and the other books in the -wise series. It is so great to hear from you! As we start this week this year, my children are 10, 8, 6, and almost 3. As I look back on my decade of parenting, I am so grateful that I “stumbled” across Babywise when I was pregnant with Brayden. I actually fully believe that it was no coincidence. I can see the many amazing things that lined up for me to be able to observe many great examples of Babywise children during my pregnancy. I looked at the contrast among children I observed and always asked the moms with the happy, content, and obedient children, “What is your secret?” The answer came back 100% of the time–Babywise. Life isn’t always roses around here. Make no mistake, Babywise isn’t some secret recipe that removes you from the experience of mortality. In the end, you wouldn’t want it to be. Mortality is a refining state. Just the other day, when talking with my friends about whether we should try to organize a ladies night in July or not, I responded an emphatic Yes! with the hashtag #toomuchsummer. We all have our days that are just plain rough. The reality, though, as I analyzed my “too much summer” thought was that I spent a month with basically no schedule. I know! Shocker! I thought it sounded nice to do for a while, and it was. It was fun week one. It was even fine week two. Week three, things became rough. So by the end of week four, I had detox in force with more structure going on. It made me even more glad for the way I have parented over the last ten years. There is a reason I have been consistent with it! Throwing structure out the window can definitely be fun on the short term, and sometimes even necessary, but it isn’t for us in the long term. This week, I hope you enjoy hearing some stories from other readers on their success with Babywise. Feel free to post, tweet, blog, instagram, etc. your own success. 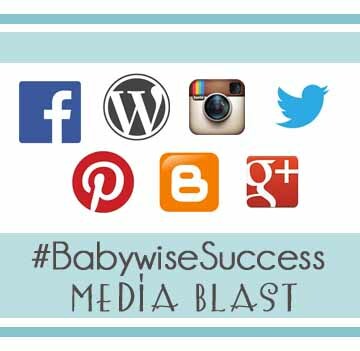 If you tag me and/or use #babywisesuccess, I will retweet and share your stories. Let’s spread the word! Note, you can find me on Instagram at http://instagram.com/chroniclesbabywisemom. Peace with 3 under Two!